This Moroccan tagine recipe calls for argan oil, a light, nutty oil which is exclusive to Morocco. While the argan oil imparts a unique flavor, olive oil or walnut oil can also be used. Beef or goat meat may be substituted for the lamb. 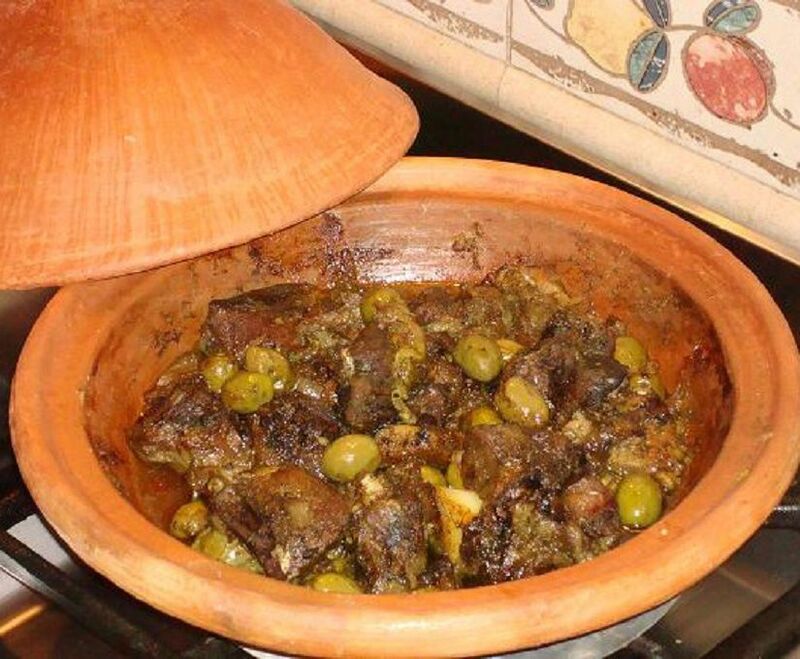 Tagine of Lamb and Olives is best prepared in a traditional Moroccan tagine (use a diffuser if cooking stovetop), but good results can be achieved by slow-cooking in a heavy-bottomed pot. Avoid high heat when cooking with argan or walnut oil. Scoop up the tagine with Moroccan bread, and try serving it with Belgian French Fries heaped on top. Layer the sliced onions on the bottom of a tagine. In a bowl, mix the meat with the chopped onion and spices, and add the mixture to the tagine along with the water, argan oil and olives. Place the cilantro bouquet on top of the meat. Cover the tagine, and place it on a diffuser over medium-low heat. It will take some time for the tagine to reach a simmer, but once it does, leave the tagine undisturbed for about three hours, using the lowest heat necessary to maintain the simmer. There's no need to open the tagine unless you smell something burning. In that case, the heat was likely too high and a little water will need to be added to prevent scorching. After the tagine has cooked for three hours, check on the meat. It should be very tender and easy to break apart with your fingers. If necessary, cook longer. When the meat is tender, reduce any excess liquid, and serve. It's Moroccan tradition to serve the dish directly from the tagine in which it was cooked. It's best scooped up with crusty bread, with each person eating from his own side of the dish.